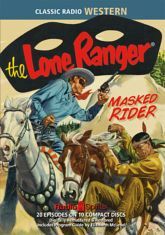 The Lone Ranger thrilled generations of radio listeners with tales of Old West drama for all ages -- and those tales are just as lively today! This heroic masked figure, dedicated to the cause of justice, is no roaring vigilante -- he is rigorously honest, morally strict, and uncompromising in his respect for the law. You'll find yourself on the trail to excitement as legendary announcer Fred Foy combines barely-controlled enthusiasm with razor-sharp diction. He's inviting you to join Brace Beemer as the Masked Man and John Todd as Tonto for ten full hours of bullets, bank robbers, and brotherhood from 1954 -- including several rare episodes!